October is that time of the year we eagerly wait for because all things good and festive start happening this month. The onset of winter, Navratri, Halloween, Diwali, and before you know it, we are RSVP-ing to Christmas and New Year's Eve party invites. So, let's bring in the festive season with these nine fashion items for a stylish Navratri this year. 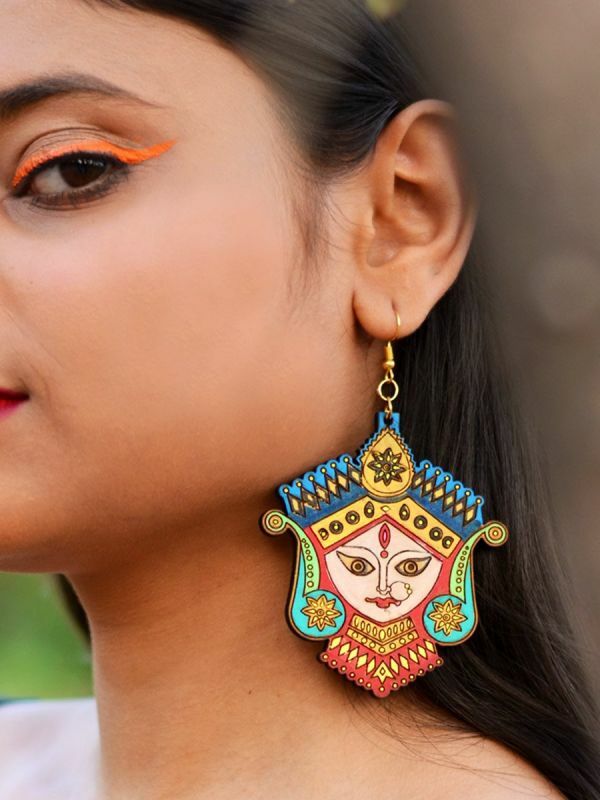 This Durga Puja, bring in the festivities with these colourful statement earrings and make heads turn as they ask you, 'Wow! Where did you get these? They look so cute!'. Trust us, you would look fine and divine with these on. Pair them with a simple kurta or suit set for maximum style. POPxo Recommends: Divine Hand-painted Earrings (Rs 499) by Krafted With Happiness. 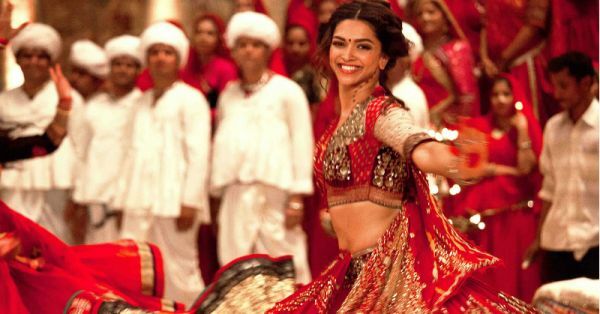 The one thing we look forward to the most during Navratri is garba. Pick these blingy sharara pants for a night out with your girl gang. Pair them with a white crop top for a fusion look or with a short solid kurti for a traditional look. Bring in the disco this dandiya night with a desi tadka. POPxo Recommends: Printed Sharara Pants (Rs 1,800) by W.
For those of you who wear ethnic outfits once a year just to please your mom (who lives to see you in Indian wear), this contemporary kurta and palazzo set will be a win-win for both parties. The contrasting gold embroidery on a solid red and silver is just the pick-me-up your festive wardrobe needs. POPxo Recommends: Quick Silver Gold Suit Set (Rs 2,999) by Bunaai. Add a pop of colour to your festivities with this bright pink anarkali-style kurta. 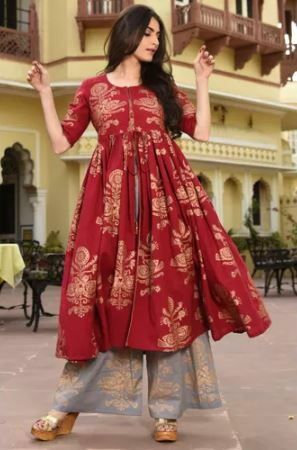 Anarkalis are the most 'extra' attire in casual Indian wear thanks to all that flare, and a royal look and feel. This one you can wear as a kurta dress or with a churidar. POPxo Recommends: Printed Anarkali Kurta with Potli Buttons (Rs 2,529) by Biba. 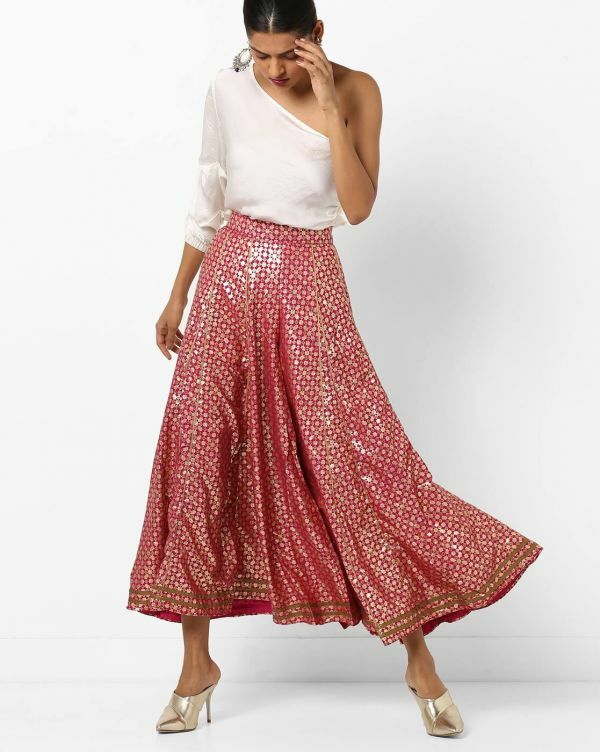 If you are a skirt hoarder just like me, then just buy this gorgeous skirt and top set from FabIndia's new collection. With a black blouse with golden polka dots and a colour blocked skirt in shades of pink, this outfit is all you need to make every twirl count. POPxo Recommends: Cotton Silk Cutwork Detail Skirt Set (Rs 5,490) by FabIndia. Believe me, ladies, having a chic golden blouse in your wardrobe can come in handy more than a little black dress. 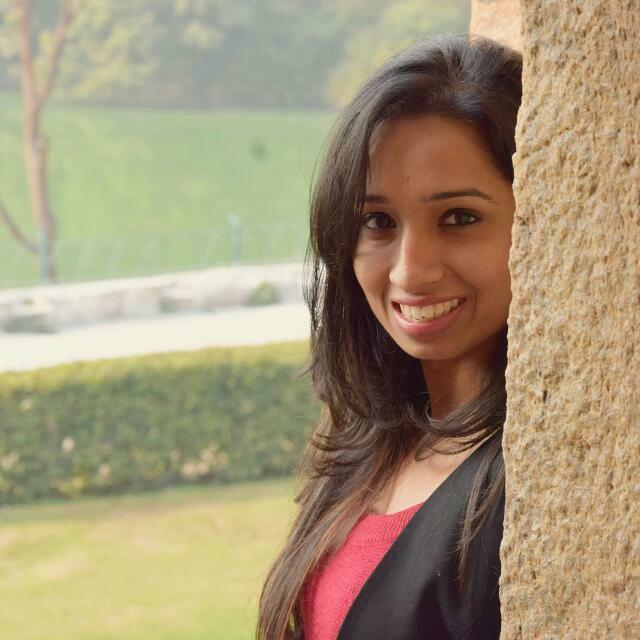 Whether there is a wedding, a festival or any other special occasion, you can pair it with a saree, a heavy maxi skirt, with wide-legged pants, and even an old lehenga. If you are all about mix and match, this is how you can make your OOTD glam for the 'gram. POPxo Recommends: Gold Angrakha Silk Crop Top (Rs 1,500) by Faballey Indya. Sometimes, all you need is a statement dupatta to up your Indian wear game. And this yellow and pink bandhej printed dupatta with tassels will take your kurta set to another level of glory. Style it with some silver oxidised jewellery and juttis for a simple and elegant look this Navratri. POPxo Recommends: Kutch Hand Bandhani Pure Silk Gajji Dupatta (Rs 5,599) by Indie Picks. 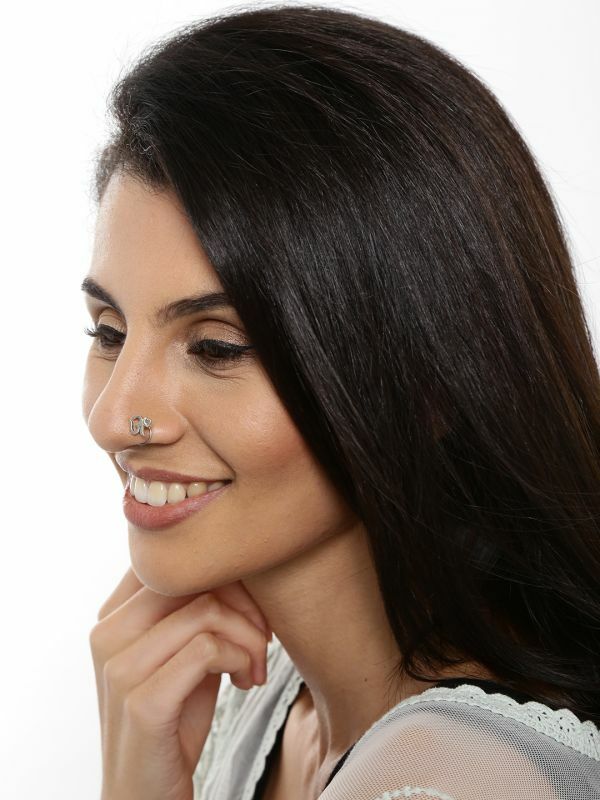 Replace your regular nose pin stud with this statement clip-on from Quirksmith in the shape of 'Om'. It is oxidised silver so it will complement any outfit you pick, and it'll up the ante. POPxo Recommends: Oxidised Silver Om Wire Nosepin (Rs 600) by Quirksmith. Just like a dupatta, a printed ethnic jacket can be a nice third piece if you don't like the hassle a dupatta often comes with. In fact, this silk embroidered jacket can also be paired with a western outfit for a kickass fusion look. POPxo Recommends: Pure Silk Viscose Jacket with Embroidered Motifs (Rs 2,000) by Ajio. #MustRead: Celeb-Approved Makeup And Hair Inspiration You Need For Durga Pujo And Navratri!